Kreinik matallics are available in a wide range of colours and textures in threads and ribbons, which can be used to enhance your embroidery projects. They help to transform the ordinary to extraordinary. 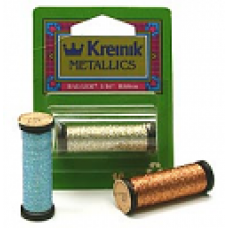 Kreinik 1/16" Ribbon can be used for Cross Stitch, Needlepoint and all forms of hand embroidery. &nb..